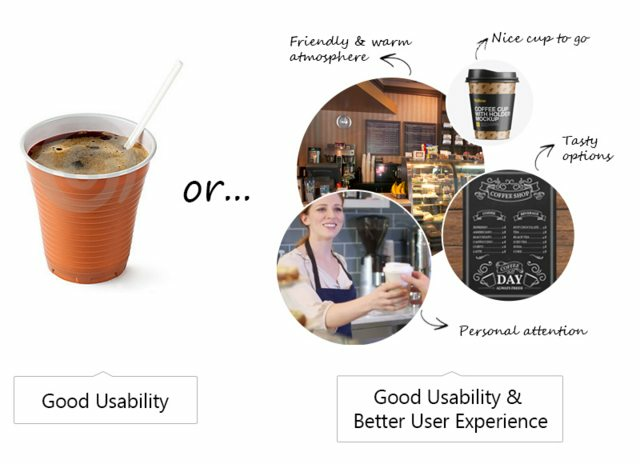 Let us talk about the difference between Usability and User Experience. I think that, to understand the difference, we can ask ourselves these two questions: Could users accomplish their goal? (Usability) and What motivates users to take certain actions? (User Experience). he can visit the coffee shop, crossing the street. A usable coffee vending machine would have clear coffee type options (high learn-ability: the ease and speed with which the users get familiar with the use of a product), work properly and deliver coffee easily, after paying (almost with no mental effort, not a word being said). A usable coffee shop would have an easy recognizable seller (or barista), clear coffee type options in the menu (almost no mental effort needed) and deliver coffee directly, after paying (only a few words being said). Praveen can choose any of these options and he will accomplish his goal - Perfect usability. But, why would Praveen choose to go to the coffee shop instead of using the vending machine, even if the machine is closer to his desk and requires less effort? So, here's where we ask: What could motivate Praveen to go to the coffee shop? He has to cross the street (he'd take a break, breath some fresh air and walk some steps. To take some time to do something satisfying feels good! Praveen feels he deserves to enjoy the moment). He would enter the coffee shop and smell coffee (smelling something tasty feels nice). He would take a look at the menu, even if he has already decided which type of coffee he wants to order (It feels like fun to give a quick look to the menu to find some new options). A seller would ask what he wishes to order? (what Praveen hears is that his wishes will come true here! It feels great). He'd get a nice branded coffee cup to go (probably bigger than the plastic coffee cup from the vending machine, with a colorful collar. Praveen feels that the whole packaging is visually attractive). Of course, it would take Praveen more time to visit the coffee shop and a little more effort than clicking one or two buttons to obtain what he wants, BUT the whole experience is much better. So, that's what may motivate him to cross the street: positive emotions. Positive emotions are the key for a good User Experience. When talking about a web project, can we design usability? Double check there are no broken links. If users can't access to the pages in your site your website becomes worthless. Make sure your site is visible in different screen sizes (Responsive Web Design). Focus on providing clear instructions that wouldn't confuse visitors making them forget their initial goal. Take them by the hand and guide them through the site. Also, can we provide happiness through design? Well, as I've mentioned in the coffee shop example, at the beginning of this article, happiness is achieved through positive emotions. So, in order to provide happiness through design we would need to stop designing nice interfaces and focus on designing intuitive and effortless flows. Designing flows that are tied to clear objectives will help us create a positive user experience. Design should focus on experience! Make sure your design is familiar than creative. A product that's designed familiar would attract more people, if it was rather creative and unfamiliar. Get into the user's mind. Users need to have positive emotions while they are visiting your site or working with your app. Wear the user's shoes and take his steps, how would he walk and visit your site and which things he is expecting to find. UX is about anticipating the user needs, designing solutions for delivering positive experience. Hope you find these tips helpful and take the chance to see the world from the user's perspective! Besides, believe it or not, we're always designing. We design with every decision we take on how to say, how to show, how to ask for something. We need that message not only to be clear but also to arouse positive emotions in people we talk to. Most of the time, without noticing, we care about how we deliver messages and how others experience what we say. We design happy moments in our minds most of the time. Usability is about the "ability to use" something. The aim for a usable product is to make it easy to use. User Experience is about feelings. The aim is to create happiness before, during and after using the product.